My recent article titled Displaying a Character Counter for Multiline Textboxes shows you how to create a character counter like Twitter for multiline textboxes. The articles does so using ASP.NET AJAX client behavior. 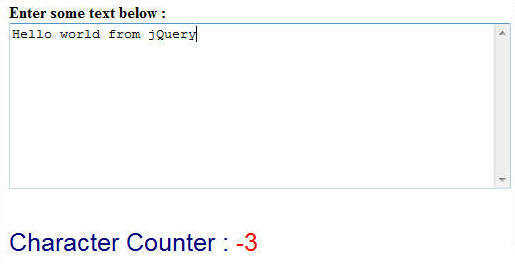 Here is a jQuery version of the code that does similar job. Note, however, that unlike ASP.NET AJAX client behavior as illustrated in the article the following code takes a "function" based approach to quickly implement similar functionality. Change MaxLength and Type to suit your requirements. Type can be Remaining or Total. AllowOverflow if set to true allows you to exceed MaxLength and displays counter in WarningCounter style. If AllowOverflow is false you cannot enter beyond MaxLength value. Also, add the following CSS classes in style sheet file or inline.